Amir H. Fallah's "Venice Beach/Toiling Male Gardener" is part of the painter's show at the Rhys Gallery. Boys love their forts, and Amir H. Fallah has taken the scrappy kind of fort that boys build as his avatar. The Los Angeles-based Fallah, not yet 30 and the founder of Beautiful/Decay, an art and design magazine that he started in high school as a punk-rock zine, has built a fort in the window at Rhys Gallery. His paintings, most of which center around forts, hang on the gallery walls. Both the paintings and the fort have an awkward, naïve quality that's hot today; it stems from street art. Fallah has said that he started as a graffiti artist, but he also went to art school at UCLA, and although his work looks rough, it's formally sophisticated; there's more to each painting than you might initially think. His topic is love, and the way he frames that also seems refreshingly young. He interviewed several men about love, asking, among other things, "Is love similar to cacti?" The answers, published in a little booklet that accompanies the exhibit, provide titles to the paintings. "Venice Beach/Toiling Male Gardener" has a high-rise fort on a purple cliff's edge housing a cactus. Fallah paints in acrylic on paper, then mounts that to canvas; the obvious rips suggest that this painting is no less a construction than the precarious structure it depicts. An ornamental border recalls Persian miniature painting, but the purple rocks at the bottom cross over that border, hinting that it's meant to be flouted and leaving us to question boundaries between real and imagined. In his paintings, Fallah's DayGlo colors sometimes give way to ethereal washes. His fort, "Terra-Lodge (C.R., G.M., S.C.)" is purely garish. The outside is black, the inside fluorescent yellow, stocked with sand and cacti. It's a terrarium of the heart, suggesting that if love is prickly, it's also succulent. 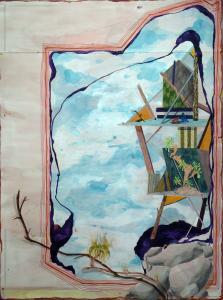 Boston artist Evelyn Rydz also has work up at Rhys Gallery. Rydz draws intricate organisms and networks inspired by bones, molecules, landscape, and machinery. Here she has taken minuscule drawings and blown them up into lush digital prints. "In an Instant 3" features three starkly drawn bird's feet clasping a squirming creature. Another form rises ominously - we are beneath it, as if gazing up at a giant lizard's throat. The result is almost filmic: There's a quickening pace, a sense of threat, a lush visual, all highly controlled by the artist yet feeling as if on the verge of chaos. Imi Hwangbo is an artist whose technique is so finessed and obsessive that it seems unbelievable. For her show at Miller Block Gallery, she cut translucent Mylar into designs inspired by Korean textiles. Each design is cut individually into as many as 30 layers of Mylar, with patterns getting larger as the paper is piled on. The flowers in "Lepidoptera" and "Peri" thus appear to have many layers of perfectly aligned petals. The result is both drawing and sculpture. Laylah Ali has delightful, pugnacious drawings up at Miller Block. She continues to explore befuddled, sometimes aggressive, cartoonish alien characters, often masked; their costumes have become more ornate. She now adds text, making stream-of-consciousness lists in the middle of each drawing that take the same anxious tone as her imagery. In "Note Drawings (10-22)," a fellow in a babushka at the bottom seems to be smoking from a hookah. The hookah, though, turns out to be a hovering, limbless figure; yet another character sprouts from her belly. The list between the man at the bottom and the two at the top includes "13. Not drilling" and "18. Stuffing a sergeant in a barrel and leaving the country." Ali's characters stand in for all of us as we attempt to make sense of what's happening in the world. They don't seem to be having much luck. Julia Shepley's glass and mixed-media sculptures at Boston Sculptors Gallery range from the sublime to the awkward. The series "Fluid States " and "Lost and Found" feature layers of glass, etched and stitched, sometimes against a plaster ground; they each metaphorically depict the brain. With rippling glass, textured shadows, and varying translucence, these pieces are enigmatic and captivating. "Seeking Level," her installation piece, is not as effectively ethereal. Glass droplets caught in knotted cords hang from glass buttons on the wall; "Catchment Pool," a box with holes in it and glass inside, is part of the installation. The idea is that water seeks its own level, but the heavy black and white cords holding the glass put the lie to any suggestion that it could be water. Terry Albright also has a show at Boston Sculptors: She grows, dries, and cuts gourds, then finishes the strips with leather dyes for a beautiful patina and makes sculptures out of them. These abstract pieces are often winsome and clever. "Marriage" has a set of parentheses, with interlocking pieces between them creating a push-me, pull-you tension.